‘Superstition’ is the band’s sixth album and the high point of their career. Recorded via a highly successful Pledge campaign that surpassed 100% of its target within 24 hours of commencement, it celebrates the devotion of the band’s ever increasing fan base whilst simultaneously demonstrating their ability to surprise and satisfy the casual listener. Originally formed via a Fine Art Program in Ontario, Canada by charismatic lead singer Chibi and guitarists Rainbow and Falcore, TBM initially self-produced and released an album entitled ‘Nothing and Nowhere’ plus an EP, ‘Violet’, backing these up with well received live shows that brought the band to the attention of Metropolis Records. Signed by the label in 2005, new songs were added to the latter and it was reissued as a full album, with a promo video for a song entitled ‘Blue’ being commissioned that displayed the band’s penchant for mixing themes of horror and tragedy with fun and satire to create a unique visual experience. The next TBM album, 2007’s ‘Walking With Strangers’, included additional production by Dave ‘Rave’ Ogilvie, who continues to work with the band to this day. 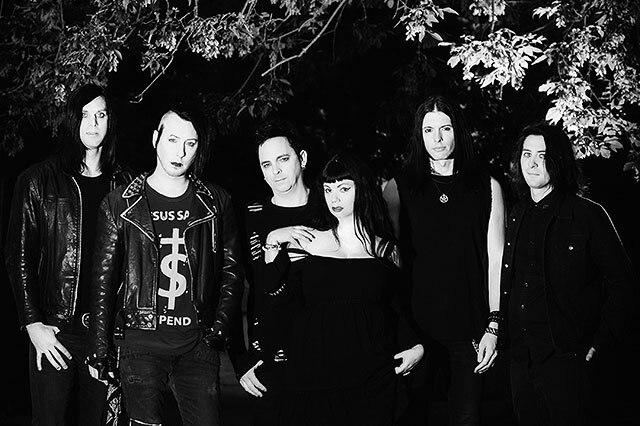 The veteran producer of acts such as NIN, Marilyn Manson and Skinny Puppy used his magic touch to help refine and expand on the group’s signature sound. The record was well received by fans and critics alike and the band toured successfully in North America with labelmates Mindless Self Indulgence and also played a number of hi-profile European shows. The intensity of their live performances was captured on film in Hamburg, Germany and this footage was subsequently assembled to make TBM’s first live CD and DVD, ‘Show And Tell’. The autumn of 2010 saw the release of a fourth studio album, ‘Pins And Needles’, which was described in one review as ‘a deliciously dark slice of guitar driven goth rock that could single handedly soundtrack the entire Tim Burton filmography.’ It was preceded by a video for opening cut ‘In The Dark’ that paid homage to ‘A Nightmare On Elm Street’ and ‘Legend’, as well as a slew of other horror and fantasy movies. TBM subsequently promoted the album via a co-headlining North American tour with Black Veil Brides. Their next release, ‘Hide & Seek’, was issued two years later and became TBM’s first Billboard chart record. Described by the UK’s Kerrang! Magazine as a ‘shot of playfully synth-drenched psychodrama’, it drew comparisons to the likes of NIN, Lacuna Coil and Depeche Mode in its wide-ranging sound palette. And now comes ‘Superstition’, an album that brings together all of TBM’s themes and experiences into one of the most intriguing yet accessible record releases in recent memory.